The CS-HDMM-100 VGA/UXGA High-Resolution M/M Cable (100') from FSR is a high-density, VGA/UXGA cable that is 100' in length. It features an HD-15 male on both ends. 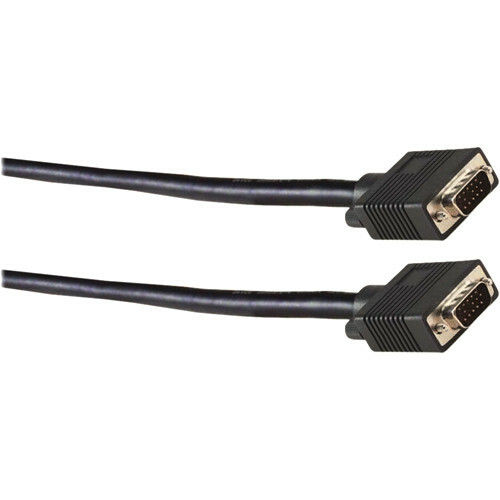 Box Dimensions (LxWxH) 12.2 x 7.5 x 4.3"
CS-HDMM-100 VGA/UXGA High-Resolution M/M Cable (100') is rated 5.0 out of 5 by 1. Rated 5 out of 5 by jgreenkee88 from Solid & Reliable We use this for our portable church setup in a high school auditorium where we need a fairly long run. It is a solid and reliable piece of gear for our video screen crew.